Another week of winners as Sixties Icon was responsible for winners in every sphere, any ground and over all trips. We hate banging the gong, but yet again he’s proved that he consistently improves mares and produces willing, adaptable progeny. On Wednesday he provided a double at Yarmouth on firm ground, whilst there was a winner over hurdles at Uttoxeter on Saturday evening and a juvenile winner at Ripon on Sunday afternoon. ICONIC BELLE is another homebred from Norman Court Stud and having given plenty of early signs of ability as a two year old, her three year old campaign was plagued by niggling setbacks. Therefore, it was as a four year old that she’s finally come in to her own and she couldn’t have repaid her owners’ faith in her any more handsomely. She took the Class 5 mile and a quarter handicap in the hands of Nicola Currie by four lengths on very firm ground in convincing fashion. Always prominent, she was the only one travelling at the three furlong marker and extended away with ease to the relief of Mick who will most probably have to make use of an entry she holds at Chepstow next week. “She’s been placed on six occasions, runner up on three and she was always likely to come good for us after a very frustrating season last year. “We could never get a run at her and we decided to down tools on her with the intention of starting back at the start of the year and she’s proved that she’s capable of winning races. That’s her eleventh run since the start of the year, so she’s certainly turned the corner in terms of her previous issues and now we’ll look ahead. Sixties Icon’s second winner on the card was the Chris Wall trained and Tom Queally ridden MARILYN in the Class 6 mile handicap. Prominent throughout, the four year old also won in convincing fashion as she and the favourite Slow To Hand drew clear of the rest of the field in the rattling ground. A maiden winner as a two year old, her trainer is hopeful that he’s found the key after a fruitless three year old campaign. Sixties also had a winner over hurdles on Saturday evening as GET READY FREDDIE took advantage of a huge weight discrepancy between his chase and hurdle ratings when running out an easy winner in a Class 5 handicap at Uttoxeter for the Skelton team. The eight year old was running off a mark twenty pounds lower than his chase rating, he was head and shoulder better than the opposition and cantered home unflustered to promise a summer campaign that may see him hard to beat. On Sunday afternoon it was AZOR AHAI’s turn to showcase SIXTIES ICON’s versatility as the two year old colt took the Class 5, six furlong novice stakes under Graham Lee in a remarkable contest that saw only two horses feature in a six runner contest. 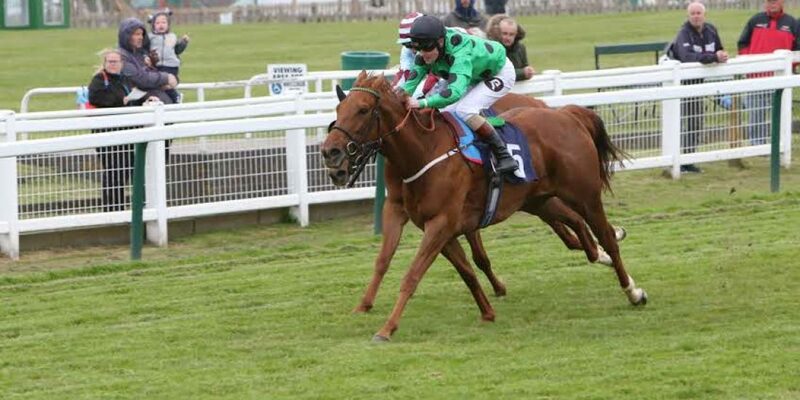 AZOR AHAI ran well on debut at Newbury a month ago, finishing a running on fourth before confirming that performance with a second placed finish at Pontefract ten days later. On Sunday, again partnered by Graham Lee, AZOR AHAI put thos experiences to good use. Always prominent on his first start over six furlongs, only the debutant Desert Lantern could go with him as they drew well clear of the field in a protracted battle in the last quarter mile. Indeed, it looked at though Desert Lantern had got the better of AZOR AHAIN inside the distance before he and Graham found plenty in the closing strides to prevail by a neck to the delight of owner, breeder and trainer Mick Channon. “This a lovely willing colt who is very straight forward. He was sort of ready made and although he was always going to be better for the step up to six furlongs, I was more than happy for him to learn on the job as he’s that sort of competitor. So a good start to the resident mare GOOD MORNING LADY’s stud career. 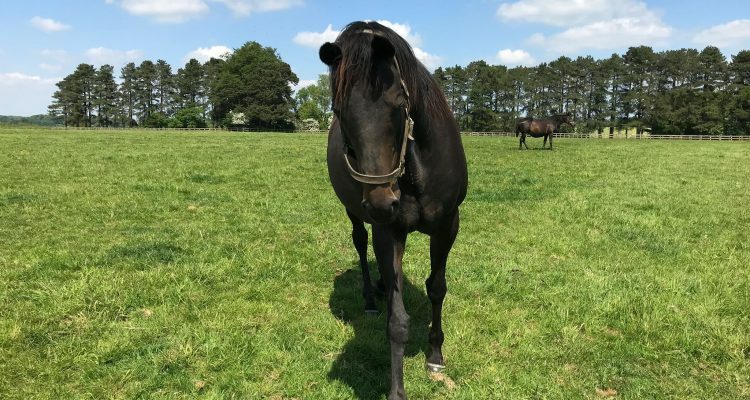 She’s in foal to Sixties again and is due any day now – not that she has any idea what her first foal achieved in Yorkshire this weekend!